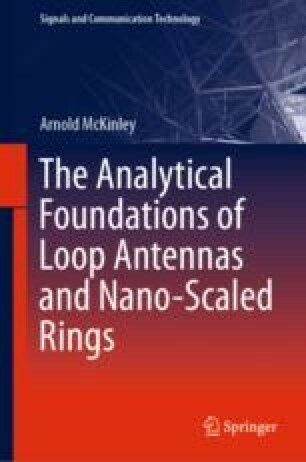 This chapter covers the analytical theory of thin-wire, perfectly conducting loop antennas and nano-scaled rings. It relies on the thin-wire approximation and assumes no energy loss in the material. The chapter covers the early history of the development of the theory and points out the difficulties and how they were handled. The governing equations that need to be solved and Storer’s 1956 solution for the Fourier coefficients are shown. Difficulties with the derivation are indicated and Wu’s 1962 fix is examined. A new elliptical solution that has not appeared in the literature to date is then derived and yields a result similar to Storer’s. The difficulties Storer and Wu encountered with regard to the convergence of the Fourier series are described. Wu’s solution solves the convergence problem. Much of the problem involves the non-solvability of the governing equation when certain mathematical models of the driving generator are used. These difficulties are summarised. The Storer and Wu solutions are summarised with the elliptical solution.